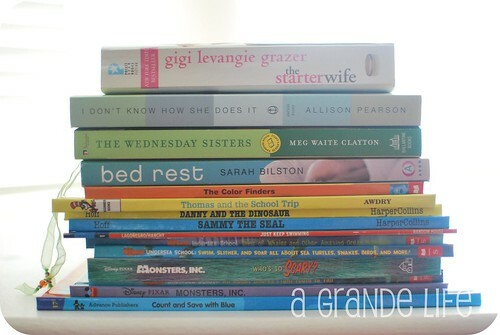 1.Join the book challenge ~ I posted the Fall/Winter Challenge Tasks over on the A Grande Life Book Challenge. 2. After our yard sale a few weeks back, I took all of the unsold books to a used book store. I hadn’t heard back so I gave them a call the other night to see what my credit was. $63!!! Of course, I was itching to get there and spend it. We went Saturday night (I know, we are so crazy). E loved running around picking out books. We got all of these books and I still have a $20 credit left! 3. Since E got a bunch of new books, we had to clean out and make room for the new ones. We said bye bye to his baby books and his library is organized and easier to contain. 4. While I was at it, I cleaned out his toys…again. We are in the process of making room in the basement for a play area. I took a bunch of toys downstairs in the hopes it would help give the hubster swift kick to get going. I also had to get another basket to put some even more toys in. 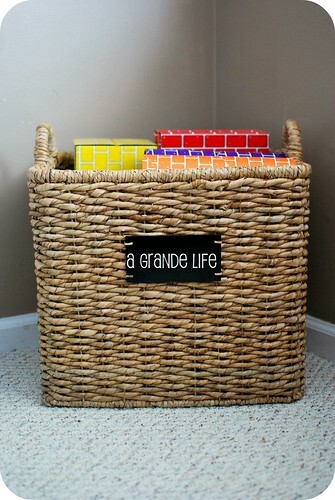 I found this great basket at Target on sale for only $28! 5. Last week, I got an email from Modern Bird Studios asking if I would like to be their featured photographer! I nearly fell off the couch. I am currently answering their questions and getting the pictures together. My goal is to get it to them by the end of the week. Don’t you worry, I will be whoring it out as soon as the post it. 6. I’m dying to try that new gel manicure that I’m seeing in all the salons. My friend, Kelly, recently got her’s done and she loves it! Has anyone else gotten it done? What did you think? 7. This weekend really felt like fall. I am so looking forward to apple cider doughnuts, pumpkin picking, and the leaves falling. I love this time of year! 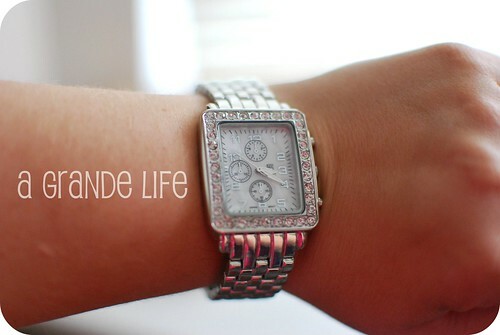 8.I finally found a new watch! I have been looking for a long time. Originally, I wanted a white one but couldn’t find exactly what I wanted. I was outlet shopping Friday night and saw this! It was perfect. I just had to have it! 10. …and over at Picket Fence. Pretty please?